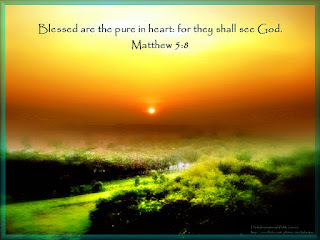 Matthew 5:8 states: "Blessed are the pure in heart: for they shall see God,"
More importantly God sees you. It's funny as well as sad but, there are those which put forth false fronts to the world. What they might not know is you can't put forth a front to God. He sees all and knows all from the tiniest of white lies to the murder's of our world. There are those I'm sure which will read that and think, "Well then there's no hope of Heaven." This just isn't true. God in his wisdom as our creator knew there's no way we as humans could hold up our end of the bargain. God put in the escape clause for us. Jesus was God's gift to us for ever lasting life, because God already knew we could never be with him because, we are not perfect. Sin is sin and a white lie in God's eyes is as major as murder. The ultimate judge and jury sentence for sin is death. God is our Father, could our own parents sentence us to death, doubtful! Regardless of how much our parents love us God loves us more, for this reason God gave his only son to redeem us of our ways. If you think those little things you do that you know are wrong is alright long as no one sees you. You would be wrong someone does see you! Don't be afraid to believe in God because you feel you could never live up to his expectations because you're right you NEVER could, but you can confess your sins and wipe the slate clean and still be with God in everlasting life. Does that mean you can do what ever you want and then confess? No, because God not only sees your sins he also sees your heart. If you live your life as good as you possibly can God also sees this, you don't have to be perfect you just have to do your best. I hope you will join me here as well.